FastCharge GSE is the licensed distributor and service agent for PosiCharge throughout Asia. FastCharge GSE through its affiliation with Posicharge is committed to continually improve, enhance, and release new intelligent energy management products for the material handling market. PosiCharge parent company AeroVironment has been developing breakthrough power electronics and battery management technologies for over 30 years. 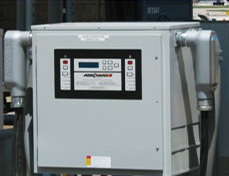 PosiCharge systems - the most advanced line of fast chargers available today, is a product of this rich heritage. When the AV Inc engineers developed the premiere fast charge system for electric cars, effectively reducing charge times by a factor of 12, they applied this revolutionary innovation to the world of material handling. They discovered that by applying PosiCharge to industrial applications, they could save material handlers millions of dollars annually by eliminating battery-changing operations. Moreover, PosiCharge makes the conversion from internal combustion to electric vehicles more affordable for operations executives and managers. By eliminating cost-prohibitive equipment and optimizing assets, AeroVironment and PosiCharge continue to play a critical role in improving the way industries and individuals interact with the environment. Entire fleets of industrial electric vehicles that move, store, and make product for Fortune 500 companies are powered by PosiCharge, every single day. FastCharge GSE was founded in 2012, directors Geoff Hudson and Darren King combined their 26 years of industry experience to focus solely on the Posicharge Product. Whilst Fastcharge is a new company, the local expertise combined with the support of PosiCharge and its parent company AeroVironment has created a solid platform for the PosiCharge solution in Asia. AeroVironment was founded in 1971 with the vision to help business and government recognize and meet their environmental and energy objectives. The company has since advanced, turning its innovative systems into large, breakthrough commercial ventures. Founder Dr. Paul MacCready is recognized by Time Magazine as "One of the Greatest Minds of the 20th Century." The American Society of Mechanical Engineers named him "Engineer of the Century." And Aviation Week has honored him with their "Aerospace Laureate" title. Dr. MacCready's ingenious thinking and innovative problem-solving approach continues to inspire the culture of AeroVironment's research, manufacturing and business management divisions. AeroVironment has supported and joined with science and industry leaders for decades, counting among its partners and customers luminaries like Delco-Remy, General Motors, NASA, Delphi, Ford and every branch of the U.S. military.